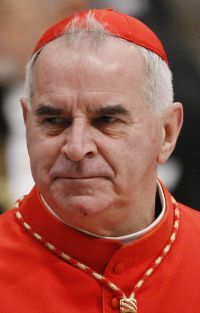 VATICAN CITY (CNS) — Pope Francis accepted Scotland Cardinal Keith O’Brien’s decision to renounce all “duties and privileges” associated with being a cardinal. The former archbishop of St. Andrews and Edinburgh, who resigned in 2013 after admitting to sexual misconduct, will no longer exercise the role of a cardinal, including by serving as a papal adviser, a member of Vatican congregations and councils, and as an elector of a new pope, the Vatican press office said. While he will no longer be invited to attend consistories and other gatherings of cardinals, including an eventual conclave for the election of a new pope, Father Benedettini said, he retains his faculties as a priest and retired bishop. The College of Cardinal’s statement also said Pope Francis expressed his pastoral concern for all Catholics in Scotland and encouraged “them to continue with hope the path of renewal and reconciliation,” the Vatican statement said. “There have been times that my sexual conduct has fallen below the standards expected of me. For that I am deeply sorry,” said his statement released March 20. “I thank Pope Francis for his fatherly care of me and of those I have offended in any way. I will continue to play no part in the public life of the church in Scotland; and will dedicate the rest of my life in retirement, praying especially for the Archdiocese of St. Andrews and Edinburgh, for Scotland, and for those I have offended in any way,” the cardinal wrote. The cardinal stepped down as archbishop in February 2013, after the Observer, a British weekly national newspaper, carried a story detailing complaints of three priests and one former priest who alleged Cardinal O’Brien had made sexual advances toward them. The cardinal initially denied the allegations but, less than a week later, he issued a public apology for his actions. He did not attend the March conclave that elected Pope Francis because, he had said, he did not want media attention to be on him rather than on the process of electing a new pope. Following a request from Pope Francis, the Vatican’s Congregation for Bishops appointed in April 2014 then-Auxiliary Bishop Charles Scicluna of Malta to go to Scotland to collect testimony for a formal investigation against Cardinal O’Brien. The Vatican statement did not mention the visit or its eventual outcome. “Cardinal O’Brien will also be reduced to a strictly private life with no further participation in any public, religious or civil events,” it said. Cardinal O’Brien, who was born in Ireland, currently lives near the Scottish border in Northumberland County in northeast England in a home purchased by the archdiocese. According to an earlier archdiocesan statement, the decision to buy the property for the cardinal was made by the archdiocese’s trustees in accordance with their duty to provide for elderly and retired clergy. It said the property belongs to the church and any future sale of the house would be returned to archdiocesan accounts.